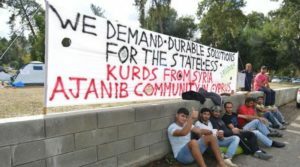 On Monday (27/03/17), stateless Kurds from Syria (Ajanib), who have been struggling to access their right to international protection and the Cypriot citizenship for the last two years, have been informed through a letter that the Interior Minister has rejected their applications for acquisition of the Cypriot citizenship which himself had suggested that they apply for. KISA considers this decision to be abusive, vengeful and unacceptable from every perspective. The minister, on the one hand, recognizes that these people are ‘essentially trapped, without passports or prospect of better living conditions’ but, on the other hand, refuses with his decision a possibility to exit from this unacceptable situation despite the fact that the applicants satisfy all the legal requirements. Their struggle began in October 2014 when along with other fifty-six stateless persons from Syria started a protest outside the Ministry of Interior, asking to be given the status of ‘recognised refugee’ so that they can live in Cyprus with dignity. On 27/04/2015, two persons from this particular group decided to go on hunger strike since the state continued to refuse to take up its responsibilities and respond positively to their fair requests. The 18th May 2015 has been marked as an important date for the struggle of stateless Kurds as the General Director of the Ministry of Interior, claiming the inflexible attitude of the relevant authorities for granting the status of ‘recognised refugee’, has asked them to apply for the acquisition of Cypriot citizenship, so that there would be a positive ending to the matter. In fact, four days later, the Interior Minister himself visited the protest site and reassured the protestors, in the presence of the Executive Director of KISA, that their applications for citizenship acquisition would be examined promptly and with the good-will to give a positive solution. Following the Minister’s suggestion, the protestors were convinced to end the thirst strike they had began, while proceeding, at the same time, with the submission of their applications for the acquisition of the Cypriot citizenship. Finally, on 04/10/15 and after surpassing several difficulties, the Ministry of Interior informed the complainants of the decision to grant the Cypriot citizenship to three out of ten persons who, according to the Ministry, satisfied the necessary time requirements as regards residence in Cyprus (at the time it was seven years for refugees). In relation to the remaining persons, the Ministry had prompted them to reapply after a year, which would allow them to complete the required residence period in the Republic. Following the reassurances and suggestions on behalf of the Ministry of Interior at the time, the rest of the complainant stateless Kurds (except those who had been previously given citizenship status) filed their applications for citizenship acquisition in September 2016. In fact, during the submission of their applications, the relevant officers of the Ministry reassured them that they would receive a response within three months. Following a 7-month period and successive discussions with the Ministry’s officers who repeated that the completion of the examination of the applications was a matter of time, the refugees in question decided to re-initiate their protest outside the Ministry until they had received a response to their request. On Monday (28/03/17) they were finally given an official letter by the Ministry, with which they were being informed that their applications for citizenship acquisition had been rejected collectively. KISA considers that this decision is illegal since all the applicants satisfy all the necessary legal requirements for citizenship acquisition, for example, more than five years of residence in Cyprus, clean criminal record, as well as the continuous and legal residence in the Republic during the last year prior to the submission of their applications. The fact that the Ministry relied on data that applies to only some of the applicants to justify a collective rejection of the applications, is unacceptable and illegal, for example that some of them were not able to learn Greek and thus have not integrated in the local society, ignoring the fact that the rest of the applicants speak the Greek language very well while two of them have studied/are studying in public schools. In fact, in the Ministry’s decision is referred the inadequate knowledge of the Greek language by the father and mother, the adult applicants, in order to justify that there is no honest desire of the whole family to become Cypriot citizens. Further, the Ministry claims lack of social bonds while in fact one of them is the father of a Cypriot citizen. Finally, in the letter they were given, the Ministry refers to their protest, which is an exercise of their right, as one of the reasons for rejecting their application. KISA considers that it is utterly unacceptable that the decision to collectively reject the applications of the stateless Kurds was taken as a punishment to the exercise of their constitutional right to protest. Further, we wonder how it is possible during a time of an alleged effort to regain the trust of citizens in the state’s institutions, that the Minister of Interior himself breaks his promises and uses his discretion provided by the law in a way that it constitutes abuse of power. The Ministry of Interior to proceed to an immediate re-examination of the applications of the aforementioned persons for the acquisition of the Cypriot citizenship. The Interior Minister to fulfill his commitments, by granting them the Cypriot citizenship.